We are among the few out there that not only offer one, but two stylish Photo Booths to choose from. We’re not talking pop-up tent or blow-up pod with flashing lights, no ma'am. Our lean, mean Photo Booth machines are top notch and full of character and charm. They are great for every event imaginable, and they never get tired of your shenanigans and selfies. So check them out and see which suits your fancy. We know you’ll love them both. Our professional camera and studio lighting equipment are housed in a modern, clean tower that looks great at any event. The Open Air design allows for large groups. We have had up to twelve people in one shot. The more the merrier. Retro inspired look and feel with modern day parts. Choose color or black & white, they both look great. Close the curtain and enjoy an intimate or ridiculous moment. No one will know. Every rental comes equipped with a variety of fun props for you and your guests to enjoy and get creative with. Each events props can vary based on personal preference. Don't like props? No problem, we'll leave them at home. Our attendants are professional, fun and skilled in all things Photo Booth. While our Booths are fully equipped to function on their own, our staff will be there to ensure all equipment is running smoothly, and assist with scrapbooks and props. Limit the fun? I think not! Feel free to enjoy the Booth as many times as you'd like. Prints are always unlimited and included in every package. From flash to print, the whole process is lighting fast, printing in just seconds. Choose from a variety of our stylish templates, customized with your name or logo and event date. We can also design something unique to fit your style or theme. 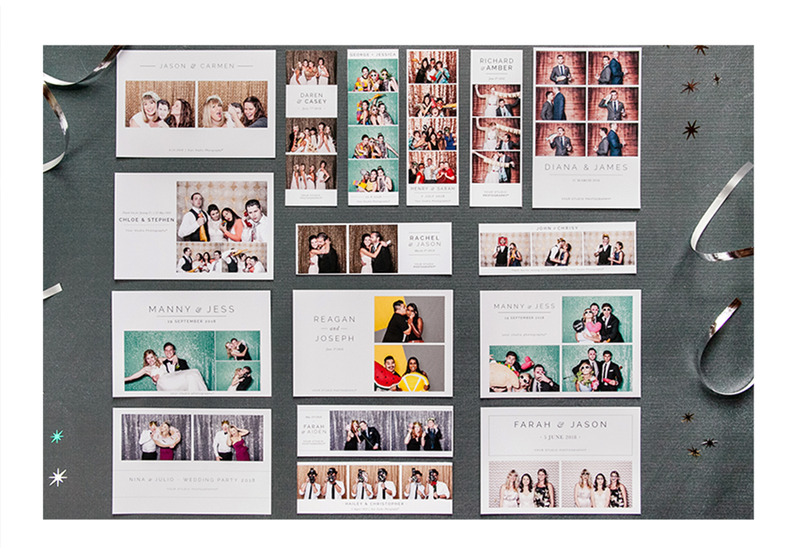 You and your guests will be able to view all the photos, order reprints and share or download files through an online gallery. If there's anything you don't want in the gallery, let us know and we'll leave it out. Nothing brings friends, family and even complete strangers together like a Photo Booth. So let your hair down, step inside the booth and go wild!